The tabletop board game is easy to learn, but every game is different. Ticket to Ride is a popular tabletop board game that challenges players to build railway lines across North America with the goal of earning more points than their opponents. The game has a lot of small parts to keep track of, but that won’t be a problem when a digital version of the game launches on PlayStation 4 later this year. In Ticket to Ride, each player draws multiple cards to determine which cities they need to connect with railway lines. 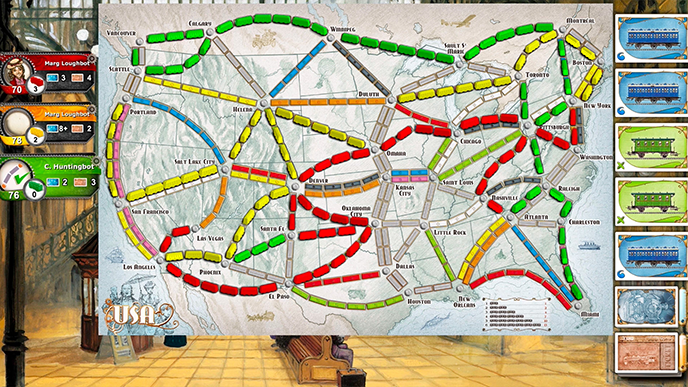 The board’s railway sections are color-coded, and players can only place their train cars on a section of track (claiming that section) when they collect the required number of matching colored cards in their hand. There’s plenty of strategy involved, as multiple players may want to claim the same piece of track, and you don’t want to let your opponents know what you’re planning. To keep hands private, the PlayStation 4 version of Ticket to Ride will let players connect their mobile devices to the game. The phone screen will show a player’s hand, so users can privately plan their moves. The original Ticket to Ride board game is recommended for players eight and up, but there’s also a junior version that can help younger players get up to speed. If you’re looking for a new option for family game night, keep Ticket to Ride in mind when it launches on PS4 later this year.